Show your love for great stories and outstanding journalism. View as "Clean Read" "Exit Clean Read"
The Millstone nuclear power station. A long, intense and expensive lobbying campaign by Dominion Energy has failed to find the votes in the Connecticut General Assembly for legislation intended to improve the profitability of its Millstone Nuclear Power Station by changing the rules for procuring electricity. 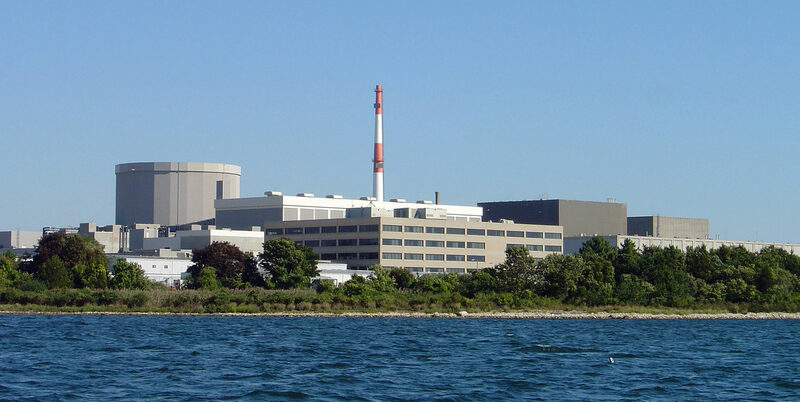 Dominion said it was seeking changes that would lower electric rates and stabilize profits generated by the state’s only nuclear-power plant, the source of nearly half of Connecticut’s electricity and most of its carbon-free energy. Opponents say the bill would cost ratepayers and produce a windfall for the plant’s owner, Dominion. In interviews Friday night and Saturday, key legislators told CT Mirror that a Senate bill sought by Dominion over the opposition of environmentalists, consumer groups, other energy producers and the utility Eversource cannot go forward, unless it is reduced to a call for a study. Senate Majority Leader Bob Duff, D-Norwalk, and Sen. Gary Winfield, D-New Haven, another energy co-chair, said in interviews Friday night that a concept passed unanimously by the Senate a year ago, only to be blocked in the House, no longer has even a simple majority. 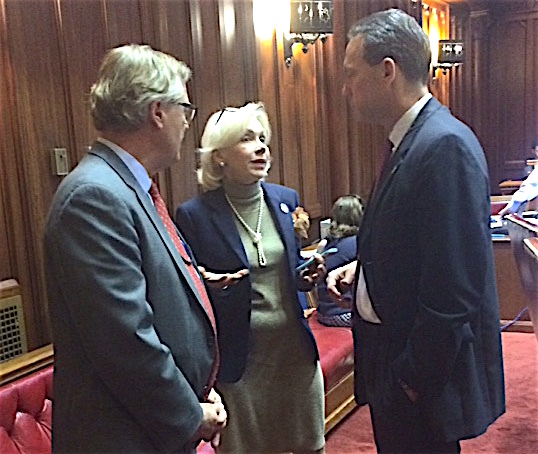 Sen. Paul Formica, Rep. Lonnie Reed and Sen. Paul Doyle confer after the nuclear energy bill passed the Senate last year. But a small army of Dominion officials and lobbyists, a visible presence at the State Capitol on Friday, had decamped on Saturday, when only the House was in session. Kevin R. Hennessy, a Dominion government affairs executive, said failure to pass the bill would be a loss for Connecticut. In the year since the Senate passed the original bill, Dominion’s opponents have mounted a lobbying and advertising campaign that matched or even exceeded the effort by Dominion. Low natural gas prices have driven down the daily auctions that set the wholesale price of electricity. Under the legislation, Dominion would have been able to use long-term contracts to lock in prices for up to half its Millstone output as a hedge against daily market volatility. Dominion had been insulating itself from the highs and lows of the spot market by selling energy through a series of futures contracts that run for three years. But the daily market is so volatile that the futures market has faltered. The bill would have allowed power from Millstone to compete in the market with biomass and trash-to-energy plants if the Department of Energy and Environmental Protection decided it was in the best interest of consumers. Dominion has neither threatened nor reassured Connecticut on the status of Millstone in an era when electricity generated by cheap natural gas has depressed the electric markets, accelerating the closure of nuclear plants that still have years of service left on their operating licenses. AARP, a grass-roots advocacy group for retirees that has grown into a broader consumer lobby, opposed the legislation unless Dominion agreed to open its books and demonstrate that Millstone was on the verge of unprofitability. Without providing details on Millstone’s finances, Dominion instead pointed to nuclear plants in Vermont, New York, Massachusetts and elsewhere that have closed or are slated to close. Sign up for CT Mirror's free daily news summary. Free to Read. Not Free to Produce. The Connecticut Mirror is a nonprofit newsroom. 90% of our revenue comes from people like you. If you value our reporting please consider making a donation. You'll enjoy reading CT Mirror even more knowing you helped make it happen. Mark Pazniokas Mark, a winner of numerous journalist awards, is the former state politics writer for The Hartford Courant and a former contributing writer for The New York Times. In more than 30 years as a reporter, he has covered some of the most compelling stories in the state, including the impeachment inquiry and resignation of Gov. John G. Rowland in 2004 and the nationally watched Senate race won by Sen. Joseph I. Lieberman as an independent in 2006. Mark is a graduate of Boston University. Gov. Ned Lamont used his first cabinet meeting to introduce a new chief performance officer and a heavily hyphenated vision to transform government into a cross-agency, data-driven, user-friendly, cost-effective and outcome-obsessed model of stream-lined efficiency and private-sector discipline. Tolls vs. ‘Prioritize Progress’: competing plans or a natural pairing? One plan for funding Connecticut's transportation infrastructure relies on tolls. The other doesn't. But which is best? Stacey Abrams at Yale: A failure to protect the vote is costing us our democracy and our standing in the world. Even Sen. Richard Blumenthal, a lead critic of the president’s conduct, stopped short of calling for impeachment after Mueller's 448-page report was released . The Connecticut News Project, Inc.
© Copyright 2019, The Connecticut News Project. All Rights Reserved.